The term diabetes mellitus comes from Greek words for “flow” and “honey”, referring to the excess urinary flow that occurs when diabetes is untreated, and to the sugar in that urine. Most foods contain Glucose. Human body also uses other chemicals to create glucose in the liver and muscles. The blood carries glucose (blood sugar) to all the cells in the body. To carry glucose into the cells as an energy supply, cells need help from insulin. Insulin is a hormone made by the pancreas, an organ near the stomach. The pancreas releases insulin into the blood, based upon the blood sugar level. 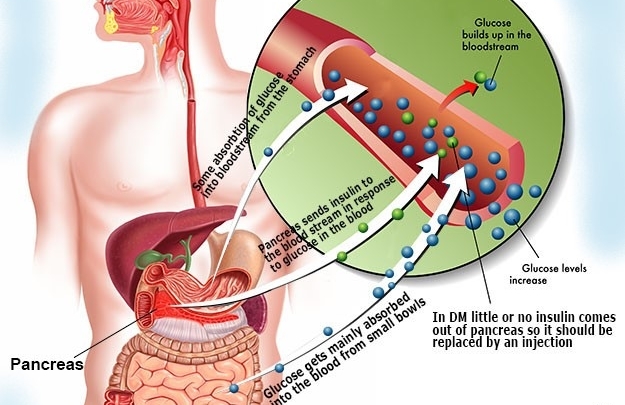 Insulin helps move glucose from digested food enter into cells. Sometimes, the body stops making insulin (Type 1 diabetes), or the insulin does not work properly (Type 2 diabetes). In diabetic patients, glucose does not enter the cells sufficiently, thus staying in the blood and creating high blood sugar levels. Glucose is a specific form of sugar, one of the simplest. It is the form found in the bloodstream. 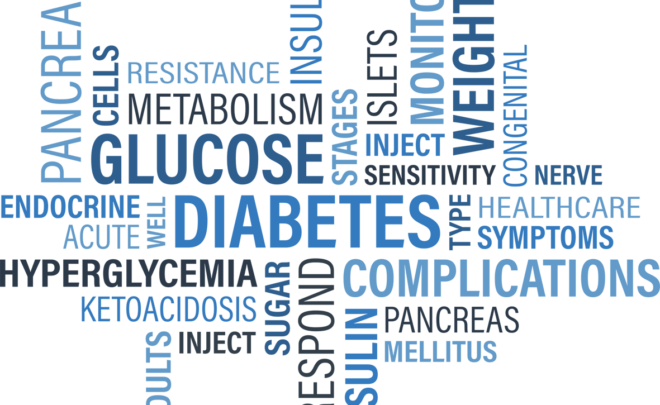 “Blood sugar” always refers to blood glucose, and is denoted as Blood Glucose. All Blood Glucose meters are specific for glucose and will not respond to other sugars, such as fructose, sucrose, maltose and lactose. Although sucrose (table sugar) is the most common sugar in food, glucose is also common. Most fruits, fruit juices, and soft drinks contain large amounts of glucose, and many foods contain small amounts. This means that you must be very careful to clean any food residue from your fingers before drawing blood for a Blood Glucose check. Since the normal level of Blood Glucose is only 1g/L (=100mg/dl), it only takes a tiny speck of glucose on your finger to contaminate the sample and give you a falsely high reading. 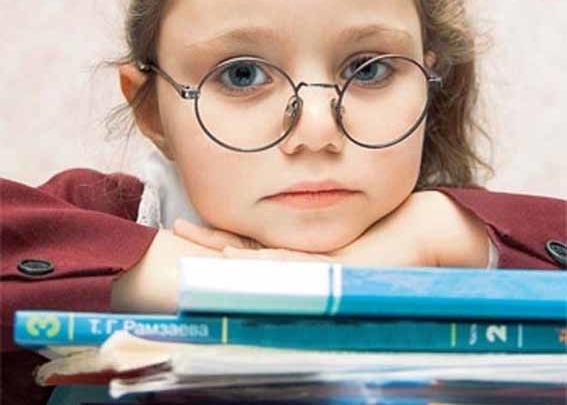 10 *micrograms* of glucose could raise the reading enough to cause you to overreact dangerously. Insulin is necessary for glucose (blood sugar) to be able to enter certain cells of the body and be used for energy. Insulin is a hormone produced in the pancreas by beta cells. The term “hypoglycemia” is used to refer to two distinct conditions. The word just means “low blood glucose”. This can occur as an insulin reaction, the result of too much injected insulin (taken to treat diabetes) compared to food intake and exercise. 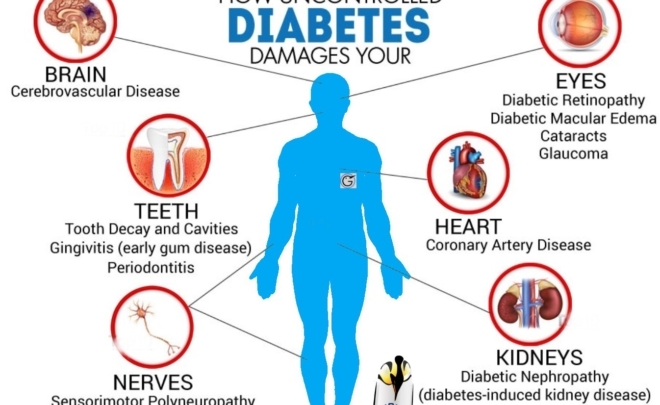 But low blood glucose can also be a chronic condition resulting from abnormalities of insulin secretion, and this chronic condition is also called hypoglycemia. 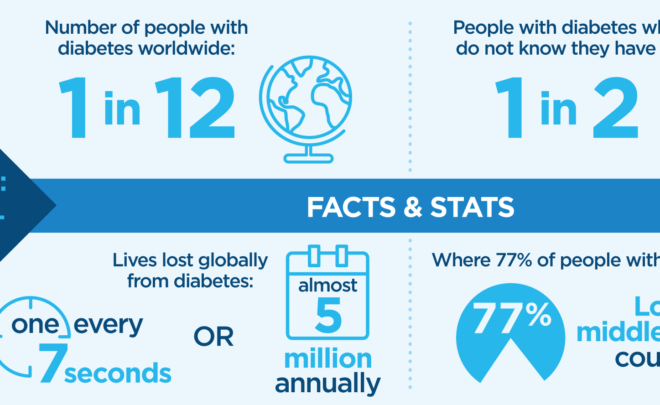 Chronic hypoglycemia may be caused by beta cells which overreact to an increase in blood glucose (Blood Glucose) by releasing too much insulin, which then causes a too-rapid drop in Blood Glucose. Such a condition, called reactive hypoglycemia, is usually handled by dietary adjustments, in particular avoiding refined sugars and large meals which stimulate the overreaction. This often requires an effort in calculating the diet and monitoring Blood Glucose levels that is equal to what anyone with diabetes needs. Chronic hypoglycemia is closely related to diabetes mellitus in being a disorder of insulin production and use, and requires many of the same techniques for its treatment. Whenever the glucose (sugar) level in one’s blood rises high temporarily, this condition is known as hyperglycemia. The opposite condition, low blood sugar, is called hypoglycemia. Carbohydrates: Eating food containing too many carbohydrates, a form of sugar. 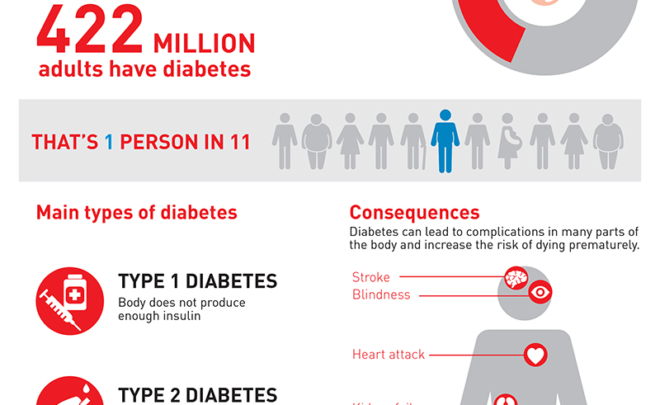 The body of a person with diabetes cannot process high levels of carbohydrates fast enough to convert it into energy. Blood sugar levels in patients with diabetes can rise within hours after eating. 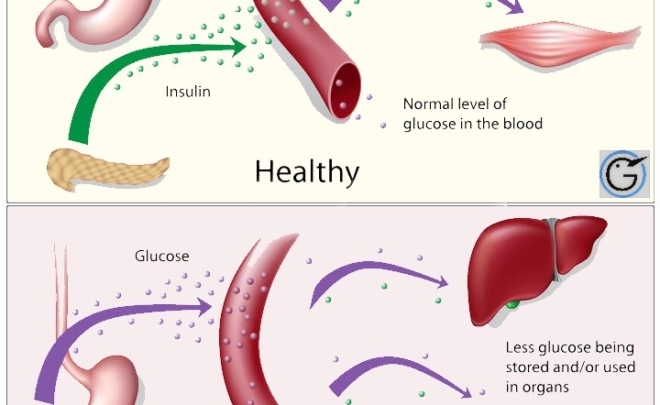 Insulin control: Not producing enough insulin action (either by injection of insulin or taking medicine which stimulates the pancreas to make more insulin). People with diabetes must control blood sugar by a combination of dietary discretion, taking medication, and physical activity. When food, exercise, and insulin are not balanced, blood sugar levels rise. Stress: Emotions can play a role in causing hyperglycemia, but should not be used as an excuse for poor control of diabetes. Little or no Exercise: Daily exercise is a critical contributor to regulating blood sugar levels. 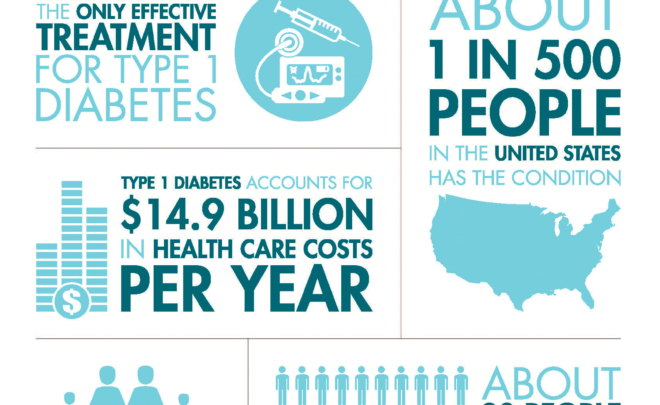 Infection, Illness, or Surgery: With illness, blood sugar levels tend to rise quickly over several hours. Other Medications: Certain drugs, especially steroids, can affect blood sugar levels.